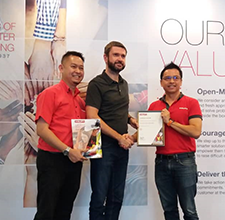 Dexion Asia and Bruynzeel Storage Systems renewed the contract for distributorship of Bruynzeel Storage Systems in South East Asia for yet another year. Dexion, largely known in the region for their pallet racking solutions and integrated systems also carries a range of commercial solutions manufactured by Bruynzeel. This includes customised static shelving, mobile shelving and art racks. Raymond Smeets, CSO from Bruynzeel recently visited offices around the region to meet with the team. Khurshed Mirza, CEO of Dexion Asia Pacific says, “We are excited to continue on this journey with Bruynzeel, especially now, with exclusivity to distribute the range in Singapore, Philippines & Hong Kong. The systems are suitable across industries; weight loads, accessories, security and finishing can be tailored to its application. For example, in Singapore where the average prime office rents is expected to rise 20% over the next 4 years, a mobile shelving system would be ideal for corporate offices, seeing that the system saves up to 50% work space. “We have a dedicated team in place and are committed to providing solutions to our customers that will help them make better use of their limited space,” Mirza adds. Bruynzeel’s systems are largely found in corporate offices, archives, warehouses, libraries and museums across Europe in companies such as; Siemens Denmark, Kellogg Company Germany, Pharmaceutical Group Belgium, Library of Brimingham UK, the Louvre in Paris, and Royal Museum of Fine Arts Antwerp, among many others. With such an extensive list of exclusive and niche customers, it is evident that Bruynzeel’s passion for smart storage meets the high expectations and specific requirements of their customers which will extend to all of Dexion’s customers in South East Asia.